Susan Bratton is founder and CEO of Meals to Heal. Meals to Heal is dedicated to making the lives of cancer patients and their caregivers easier and less stressful by providing services which relieve them of the significant time, energy and worry associated with ensuring proper nutrition for themselves and their loved ones. What a great mission anyone can get behind! My motivation to start the business was two-fold. The first was a general desire to move within the healthcare sector from finance to something closer and more impactful on patients. The second was the diagnosis, treatment and loss of a dear friend to a brain tumor and the resulting realization that cancer patients and cancer caregivers struggle terribly with getting proper nutrition, nutritional information and nutritional counseling. I wanted to help people like Eric and his family get better and safer access to proper nutrition and nutrition information. How did you go about financing your business? I focused on friends and family who knew me and trusted me as a starting point. Then, I widened the network to people with whom I had done business and who I knew were investors in small companies. I tried the SBA and found it to be completely useless (!!). In fact, it is a myth that the SBA actually loans money to small, start-up businesses. That is what they are supposed to be doing but, in reality, those who get the funds are larger, more established businesses. So a word of advice — don’t waste your time and energy. It is a MAJOR time sink with a low probability of success. One thing that I was told “off the record” by a SBA loan officer was to apply for an SBA loan while you are still employed elsewhere as the SBA looks for income to support the loans they make and, if you quit your job to start a company like I did, you won’t have any income to show. I am not sure this is the most ethical thing to do but it is what someone doing SBA loans told me that he recommended. How did you discover your uniqueness for your business? I always knew I was an entrepreneur at heart. I think it was more that the timing was never right and I didn’t have the confidence to “jump off the diving board” into the waters of entrepreneurism until I had other successes behind me which built some confidence. I also really believe that there needs to be a passion behind any entrepreneurial business and, until my friend Eric was ill I hadn’t found that passion. But, having been interested in nutrition my whole life and, then having an experience like the one with my friend, created condition that inspired my passion. How long did it take for you to actually turn a profit? We are four months into generating sales and we are not yet profitable. Right now I celebrate the addition of a new customer or new Twitter follower or subscriber to my blog by sending out an email to my entire team, with whom none of this would be successful. We are all passionately committed to our mission and I like to share the successes with those who are so committed and responsible for the success. How did you get your first customer? How do you attain them now? We got our first customer through a pilot program that we established with a large oncology clinic. The combination of having brochures in their waiting room, combined with our pilot partner’s commitment to educating their patients about the program led to the sale. Today, we achieve the majority of our customers through these types of partnerships. I expect that, as we build awareness of our services through PR, marketing and social media, we will also gain customers through these channels. How did you determine the price to charge? In two ways. The first was market research on what people would pay which resulted in a range and the second was in looking at the wholesale price to us to produce the product and then factoring in a mark-up in order to generate a profit. Our information and access to credentialed oncology dietitian services are free because I felt like we should provide the information, in particular, to anyone who is looking for it and needs help. How did you determine the best methods to market yourself and or your service/product? In a number of ways. I first thought about how a sale would occur and who the decision maker(s) were. From there, I then looked at the most efficient and cost effective ways of reaching them. So, for example, in oncology the social workers and the oncology nurses are key influencers of both patients and caregivers as they tend to spend more time with the patients than the oncologists and because their focus extends beyond the medical piece into financial and quality of life issues. Then, I determined the best way of reaching these influencers. I also looked at ways to reach customers directly. Do you belong to any Business Organization or Networking Groups? I do. I belong to Healthcare Business Women’s Association and the Women Business Leaders in Healthcare groups which have been two terrific sources of networking and leads. What are your “must” have tools you use to run your business? A good website is essential for any business because customers want to learn about you and your business by reading your website. The second is a great technology partner – either your web developer or someone in the digital marketing space as they can “optimize” the website and make it more efficient and effective in reaching and communicating with customers. The third is a partner. This doesn’t have to necessarily be an equity holding person although optimally it would be because then they are fully committed to the mission as you are. A partner is important because one needs to bounce ideas off of someone and working in a vacuum can lead to poor decisions. I would add that beyond that one “partner” also a network of people to bounce ideas off of and who have core competencies in areas critical to the success of your business. For example, marketing, technology, operations and finance. A good alarm clock and discipline! There is so much to do in a start-up and getting up early is essential – it allows you to think and organize your day before the phones begin ringing off the hook and, frankly, it gives you more hours to work which in the beginning seems to be essential. Also, discipline and focus. Do you ever get burned out and want to give up? If so, how do you get past that? I have not been burned out but, rather, sometimes very exhausted. When that happens I try and find a little time for me to not focus on the business. Like a walk on the beach or going to a movie with a friend. It is really important to not isolate and close yourself off from the world. But that has to be done with discipline too. The other thing that gets me past “down” days or days where I am exhausted is remembering the courage, graciousness and positive attitude of my friend Eric and his entire family. The way they all dealt with the illness was inspiring. And I remind myself, how Eric would have loved to have the opportunity to be doing what he loved and that I have the health and vitality that he didn’t. The other thing that “keeps it real” for me is that I volunteer at Sloan Kettering in pediatrics. When I think I have it tough all I have to do is show up there and see children ill with cancer and their parents and siblings trying to cope with it and I am reminded that I have my health and that I have the opportunity that many others don’t. Were you always confident that you would be a success or did that come over time? I have believed in this business from the start but there have been days where I hit some obstacle or wall and felt like my dream would not come true. And, then I figured a way around the challenge. One of the most important things to remember is that a) you WILL run into challenges and days where everything goes the wrong way and it looks like your business will fail and b) that you have to be flexible and responsive and creative in order to morph your business into something a little bit different than your idea or to create a solution to whatever obstacle lies in your way. It is important to not be too tied to one, and only one, business plan. Often times the market will tell you that what you think they want they don’t, in fact. And, so you may need to change or tweak the plan a bit in order to meet the needs the customers are telling you that they have. I am seeking the advice of people who are experts and I am testing different strategies and evaluating how they work and what their results are. What are the best classes, books and/or resources you use that really has helped you professionally and personally? Social Media Marketing for Dummies has educated me in many ways and, because that is the area that i have the least experience and is the most important to my business it is also the most helpful. The other resource that has been invaluable has been my advisory boards – both the Board of Directors and Scientific Advisory Board. Both have provided great advice and input that I have taken to heart. I would advise anyone starting a business to form an advisory board and to put people on it who will challenge you and who will tell you what they think and who have expertise in areas where you do not. They can be an invaluable source of help. What other advice would you like to share? My biggest piece of advice is to be passionate about what you are doing. Pursue something that you believe in and that you can get fully behind even when things look very difficult and unpromising. But I would temper that with advising to “do your research”. Before embarking on a plan that involves quitting your well-paying job with benefits to do a start-up company you need to do a lot of primary research. Really look to confirm that there is a need that you can meet. And, that the market is big enough. And understand how sales are generated in the market. If it is a more scientific endeavor then read the research in the sector and know what is the latest research and how it impacts your idea. Once you have proven to yourself, as a tough critic, that your idea is well thought out and credible, then pursue it with passion, dedication and hard work. Also, laugh. There are some days that are just rough. Be willing to look at it with humor and realize that you will make a million mistakes and that is ok.
Care about what you do, about your employees and your customers. Reward and encourage those that work for you….it will inspire passion and dedication. And appreciate what they do and make sure you tell them. Create a collaborative and positive work environment as it will send a message to your customers too and it will be a great place to work as an employee. Where can we find your products and services and how can we best connect with you? Our website is http://www.meals-to-heal.com and we can be reached on the phone at 888-721-1041. You can also find Meals to Heal on facebook. 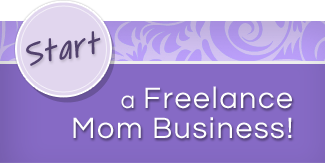 FreelanceMom.com thanks Susan for taking the time to do this interview.